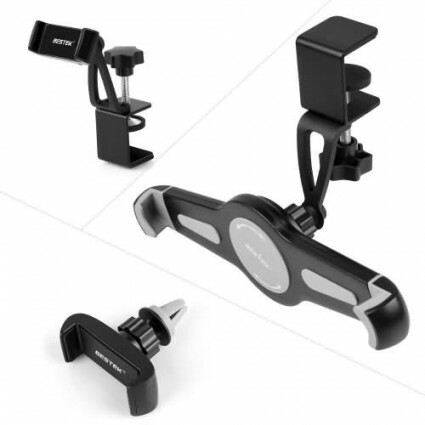 BESTEK 3-in-1 smart phone can meet your various needs for desk phone holder, car air vent and tablet holder. The cellphone holder is compatible with any smart phones and 9.5~14.5 inches tablets. Each style is sturdy and well built to make your life easier. The cellphone holder set can be used as desk phone holders, car air vent holders and tablet holders, meeting your various needs at home, office, car, kitchen and making life easier. The mount holder is compatible with any smart phones and any tablets with 9.5~14.5 inches, including iPad air/iPad Pro/Surface and more. With sturdy holder, enjoy mobile fun freely. The car air vent is adjustable for any sized cellphones in car. Made of rubber base, the holder is sturdy enough. Strong magnetic head can protect your cellphones from dropping. The mount holder is 360°rotatable with an adjustable clamp head, allowing you to set your phones to any angle for the optimal view angle on the desk or table, in the kitchen or bookcase, easier to install and use.